The technical justification is not a new invention but the ENIQ documents have resulted in a more uniform structure of this document type. At the same time this new structure has made it easier to adapt the technical justification to widely different purposes. The introduction and adaptation of the ENIQ recommended practice make it easier for everybody concerned to read and evaluate the technical justification. If nothing else the ENIQ approach gives better and more consistent documentation. Since 1994 FORCE Institute has been involved in numerous qualification projects for the nuclear power plants. The projects have among others included main re-circulation loop welds, core shroud welds and pressuriser surge, spray and safety-relief nozzle welds. The materials involved have ranged from cladded carbon steel through stainless steel pipes and welds to Inconel welds in different configurations. FORCE Institute today has 20 different qualifications, several of which are valid for two or more plants. A technical justification can serve different purposes. One possible purpose is to justify a new examination technique including procedure(s) for a particular component or group of components. Another possible purpose is to justify a change of examination equipment for a previously qualified task; this could typically be in connection with upgrade of equipment to newer versions. A third possible purpose is to justify the transfer of a previously qualified technique to a new component - in the same or in another plant. Over the years, FORCE Institute has performed all three of the above tasks. Since the first qualifications there has been a still increasing requirement to the content of technical justifications. This in itself has off cause been a challenge but the main problem has been that no formal and well-defined requirements to the content existed. This resulted in different evaluation from case to case by the qualification body depending on the individual dealing with the case. Previously a qualification task usually started with fabrication of one or more test blocks. The block(s) was then shipped to the laboratory that typically hadn't been involved in the design of the block or the defect population. Based on experience and qualified guessing a large number of examinations of the test block(s) were then conducted. After evaluation and documentation of these results the final technique was decided and the procedure(s) written. This way of working often resulted in quite a few test block examinations, some of which later proved to be of no use, except to show that this particular technique didn't work. With the ENIQ recommended content for technical justifications and the philosophy embedded therein a radically different approach to procedure development has been introduced. Now the approach should be to sit down and carefully consider the scope of the task based on the input from the customer in the form of component details and defect types and sizes. During this process the most promising techniques and the problems and limitations should be identified through physical reasoning and possibly modelling. The worst case scenarios should be identified and in many cases used as input to suggestions to test block design including defect population. This approach means that the test block design is moved from the very start of the project to a later state and at the same time the volume of test examinations is typically considerably reduced. This way of working requires that the laboratories be involved at a very early state of the project. The implementation of the ENIQ approach has not been and is not, without its problems. Many people have to learn a whole new way of thinking and working, which takes time. The emphasis on essential variables is another aspect that is not as straight forward as it may seem at first glance. Many man-hours has been spent in meetings and elsewhere in order to compress this problem into something manageable - a task that can be dealt with in a serious manner without requiring more manpower than all other tasks within a project put together. There is, however, no doubt, that this approach, when fully implemented and when people have gained some experience with it, will result in more efficient qualification projects. In connection with the implementation of the ENIQ methodology a group of people from the Swedish nuclear power plants, from laboratories in Sweden, from FORCE Institute in Denmark and from the Swedish qualification body (SQC), have worked out a common interpretation of the ENIQ recommended practise for technical justifications. This 'internal' document mirrors the viewpoints of the involved parties and is going to be updated, as more qualifications have been carried through and thereby more experience gained. The 'internal' document forms a common framework not only for producing technical justifications, but also to a large extent for the complete qualification project. As approaches and philosophies are likely to be somewhat different elsewhere, similar working groups could probably with advantage be formed involving other plants, laboratories and qualification bodies. A uniform interpretation of the ENIQ methodology within all of Europe - or world wide - is probably much to hope for, although it could facilitate co-operation and sharing of experience across the international community. This should result in maintenance of the high level of safety and quality, not only within the nuclear sector, but within all the industrial sectors. 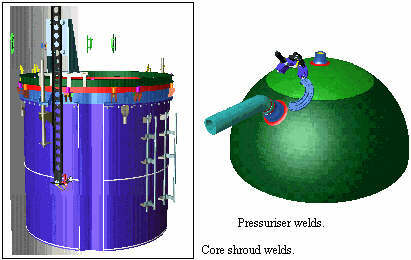 The first qualification FORCE Institute was asked to carry through, after the implementation of the ENIQ methodology, was an expansion of an existing qualification, including both a detection and a height sizing procedure for weld examination, to include a component with an almost identical weld configuration. Original weld configuration. New weld configuration. Fig : Cladded carbon steel with Inconel weld. The only difference between the two welds was the bevel angle that was 10° (qualified case) respectively 15° (new case). First the differences for the ultrasonic examination with respect to changes in attenuation because of change of amount of weld material to penetrate and the difference in possible defect orientation (lack of fusion type defects) were identified. Then it was shown that the differences were negligible or even beneficial in those cases where the change in weld geometry could have any influence at all. The technical justification was constructed in accordance with the ENIQ recommended practise and supplemented with a limited amount of verification scannings on a test block with the 'new' type of weld, to show that the reasoning and calculations were correct. Both the new procedures (technically identical to the already qualified procedures) and the personnel were qualified without request for further practical demonstrations. The Swedish nuclear power station Oskarshamn (for which the project was carried through) was very helpful during this 'milestone' project. If one uses the ENIQ approach on a new full-scale qualification project there is specially one problem that should be brought to attention. During the initial stages of the project the best possible techniques are reasoned and modelled out. Based on this a group of worst case defects are identified and used as input to test block suggestions. If however the techniques are changed slightly at a later stage of the project, the worst case defect population may change and thus require changes to the test block(s). This may seriously delay the production of the test block(s) and thus delay the whole project. It may therefor be necessary to agree on a deadline for changes to techniques and thereby possibly changes to the test block(s). The same problem may arise if the scope of the project for some reason is changed at a time, where the project is otherwise well underway. To catch up on such situations as early as possible it is recommendable to start out with a qualification strategy (document) that all involved parties can agree to. This strategy should include milestones and check points spread out along the project. Frequent contact between all involved is essential, to ensure the best possible co-ordination of the resources and to catch up on any changes/deviations as early as possible. It is very difficult to judge whether the implementation of ENIQ has resulted in or will result in an improvement of the qualified techniques. There is however no doubt, that the qualified techniques will be better and more consistently documented. This documentation will facilitate re-use of techniques and transfer of existing qualifications to new objects, thus in the long run save time and money.